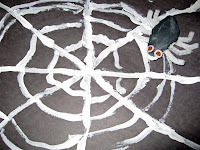 A few of the kindergarten classes painted spider webs this week. One class had time to also construct three dimensional spiders. We used Crayola model magic. They were adorable... wish we wouldn't have used the white pipe cleaners though. It makes it tough to see on the web. FYI: If you click on any of the photos you will get a larger image.